"If you liked Braveheart, Gladiator and Titanic, you will love Noah." 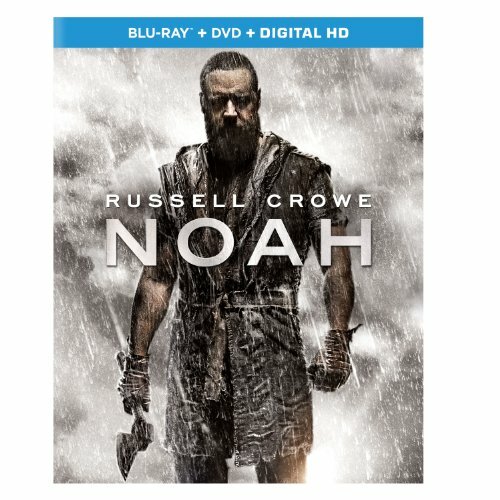 HOLLYWOOD, Calif. - "One of the most dazzling and unforgettable Biblical epics ever put on film" (Richard Roeper, Chicago Sun-Times), the thrilling story of courage, sacrifice and hope, Noah debuts on Blu-ray Combo Pack, DVD and VOD July 29, 2014 from Paramount Home Media Distribution. The film arrives two weeks early on Digital HD July 15th. Visionary director Darren Aronofsky's (Black Swan) "action spectacular" (Joe Morgenstern, The Wall Street Journal) is being hailed as "a fascinating achievement" (Eric Goldman, IGN) filled with "grit, grace and visual wonders [that] never cease" (Peter Travers, Rolling Stone). "Russell Crowe has simply never been better" (Pete Hammond, Movieline) as the title character who takes on the monumental task of building the legendary ark, saving the chosen few and surviving the great deluge. The film also stars Academy Award winners Jennifer Connelly** and Anthony Hopkins*** and features Emma Watson, Logan Lerman, Ray Winstone, and Douglas Booth. Noah will be available in a Blu-ray Combo Pack with Digital HD that includes over an hour of in-depth, behind-the-scenes special features that delve into bringing this epic story to the screen, filming on location in the exotic landscapes of Iceland, and the colossal undertaking of creating the massive, life-sized ark. The Blu-ray Combo Pack available for purchase includes a Digital Version of the film that can be accessed through UltraViolet(TM), a new way to collect, access and enjoy movies. With UltraViolet, consumers can add movies to their digital collection in the cloud, and then stream or download them--reliably and securely--to a variety of devices. The single-disc DVD is presented in widescreen enhanced for 16:9 TVs with English 5.1 Dolby Digital, French 5.1 Dolby Digital, Spanish 5.1 Dolby Digital, Portuguese 5.1 Dolby Digital and English Audio Description and English, French, Spanish and Portuguese subtitles. The disc includes the feature film in standard definition. Paramount Pictures and Regency Enterprises present a Protozoa Pictures production of a Darren Aronofsky film: Noah . Music by Clint Mansell. Executive produced by Ari Handel and Chris Brigham. Produced by Scott Franklin, Darren Aronofsky, Mary Parent and Arnon Milchan. Written by Darren Aronofsky & Ari Handel. Directed by Darren Aronofsky. Paramount Home Media Distribution (PHMD) is part of Paramount Pictures Corporation (PPC), a global producer and distributor of filmed entertainment. PPC is a unit of Viacom (NASDAQ: VIAB, VIA), a leading content company with prominent and respected film, television and digital entertainment brands. The PHMD division oversees PPC's home entertainment, digital and television distribution activities worldwide. The division is responsible for the sales, marketing and distribution of home entertainment content on behalf of Paramount Pictures, Paramount Animation, Paramount Vantage, Paramount Classics, Insurge Pictures, MTV, Nickelodeon, Comedy Central and CBS and for providing home entertainment fulfillment services for certain DreamWorks Animation Home Entertainment titles. PHMD additionally manages global licensing of studio content and distribution across worldwide digital and television distribution platforms including online, mobile and portable devices and emerging technologies. "ACADEMY AWARD(R)" is the registered trademark and service mark of the Academy of Motion Picture Arts and Sciences.